Ever since Hurricane Sandy, gasoline has been in short supply in the areas hit by the super storm. 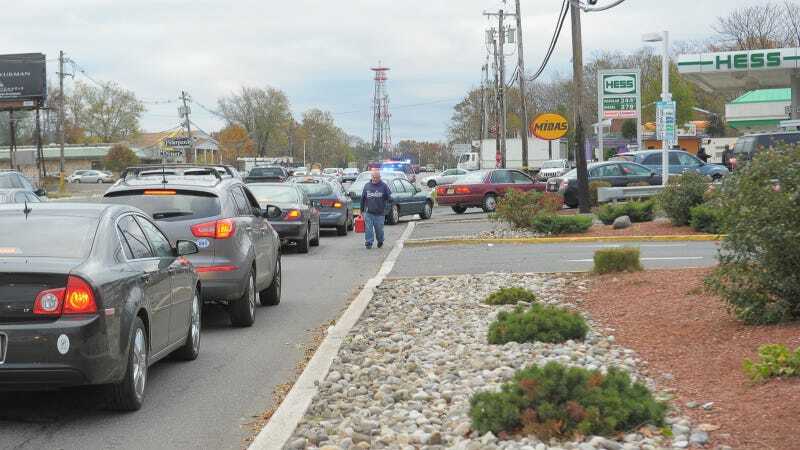 Lines for fuel in some areas have become ordeals that last for hours. One place that avoided gas rationing was New York City. That just changed. Mayor Bloomberg has just announced that odd/even rationing will be taking effect in New York City starting at 6 AM tomorrow. This is because 25 percent of stations in the city are still closed and lines are horrendous. New York City is joining other counties across New York as well as New Jersey in enacting the rationing to help curb the long lines that have resulted from the shortages. What does odd/even mean? If the last number in your license plate is odd, you can get gas on odd days. If it's even, you can get gas on even days. If you have a cute vanity plate with no numbers, it sounds like you'll never be able to get gas again and are screwed for all eternity.